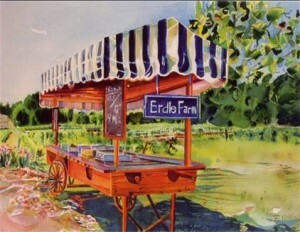 Erdle Farm started out nearly 40 years ago with a few small, 100+ year old Concord vineyards. Over time our Silver Creek farm has expanded with additional vineyards and berry plantings. Concord grapes still make up the majority of our acreage, producing those juicy grapes that are destined each fall for the presses at our cooperative, Welch’s. But our Elmwood-Bidwell customers really know us for our blueberries, strawberries, raspberries, blackberries and seedless table grapes. Now in our second generation, we look forward to continuing to grow and make available for our loyal customers the freshest, highest quality berries and grapes each and every Saturday. Our family farm has long followed sustainable farming practices with the intent of having the smallest environmental impact possible. We value our working relationship with Cornell University and adhere to Cornell’s recommendations, as well as those of the Chautauqua County Soil and Water Conservation District, and the New York State Integrated Pest Management Program. In farming our land season after season, we’re mindful of how those we interact with are affected, whether it’s our neighbors that live beside our farms, the bees in our hives that do the pollinating in the spring, or our customers that visit our farm or at the market. Berries and grapes are some of the healthiest foods on earth! We strive to enrich our land so that the next generation of fruit growers will be growing them for the next generation of customers. Besides our Elmwood-Bidwell Farmers Market on Saturday mornings, we offer U-Pick berries throughout the summer. The farm opens in mid-June with the start of strawberry season, and closes in early September at the end of the blueberry season. Our farm is located at 12229 Hanford Road, Silver Creek, NY. We’re just a mile east of town and one mile south of Routes 5 & 20 (exit 58 of the Thruway). We’re open 7 days a week from 8 a.m. to 8 p.m. Monday thru Friday, and 8 a.m. to 6 p.m. Saturday and Sunday. Give us a call at (716) 410-0599 to check out what’s in season, or follow Erdle Farm on Facebook.